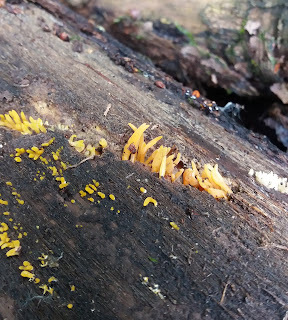 These tiny yellow spindles were only a few millimetres tall, and appear every year on rotting deciduous logs in one of the habitat piles in the wood. There is a second Calocera sp.but no need to get the microscope out as the second species is host specific on coniferous logs. The recent rain has started to bring some fb's up. I saw the first Deceivers (Laccaria laccata) in the wood today!